These are the most common red and white wine grapes grown in the world. The King of Red wines. “Cab” is a wine that is dark colored, almost black, and dry. It has more substance and weight than almost all other red wines. Generally it becomes more approachable with age. Grown around the world, it is among the most expensive red wines. Great with steak, chicken, lamb, or beef. More approachable than a Cab and generally more affordable too. In traditional Bordeaux wines Merlot is used to soften the Cabernet Sauvignon. Still dry, it has more of an upfront fruit flavor than a Cab. Fruit flavors can be of black cherry, strawberries, plums, or figs. Generally not as expensive as Cabs. Grown not only in France but in Chile, Italy, Washington State, Oregon, and California. Goes well with grilled meats, fowl, chicken, and pork. Not as weighty or dark colored as a Cab or Merlot, this wine is known for its complexity. It tastes of black cherry, spice, and raspberries. In addition to France, it is grown successfully in California, Oregon, and New Zealand. Because it is difficult to grow it can be comparable in cost to Cabs. Matches well with pork loin, ham, swordfish, veal, chicken, roast beef, and beef stew. Syrah or Shiraz primary red grape in wines from the Northern Rhone [labeled Hermitage, Cornas and Côte-Rôtie] A dark-colored wine, it tastes of pepper, spice, black cherry, earth, tar, leather, and roasted nut flavors, and has a smooth, supple texture and smooth tannins. Australian versions can be 100% Shiraz or blended with Merlot and/or Cabernet Sauvignon. Examples of French blends are Châteauneuf-du-Pape and Languedoc-Roussillon. Shiraz is generally more affordable than Cabs, particularly Australian versions. Goes well with grilled chicken, turkey, stews, duck, pork chops, and lamb. Dry, fruity, and full-bodied with a dash of spice. It is a dark-colored red wine that is among my favorites. Mainly grown in California. Its cousin, Primitivo, is made successfully in Italy. More affordable than many other red wines. Matches well with turkey, steak, hamburgers, and beef. This wine is really hot right now. Why? When made well, like it is currently in Spain (and France), it can taste stunning. In addition, its price has been so affordable, the complete package is hard to beat. Australian versions are often blended with Mourvédre and Shriaz. In France it is associated with the wines of the Châteauneuf-du-Pape wine region. In Spain, the Cataluna/Priorat, Rioja, and Navarra wine regions are leading the way. When such a grape is made in so many different regions, the style can vary considerably. In general, it tastes of rich black cherries, honey, coffee, and blackberries. Try it with grilled meats. 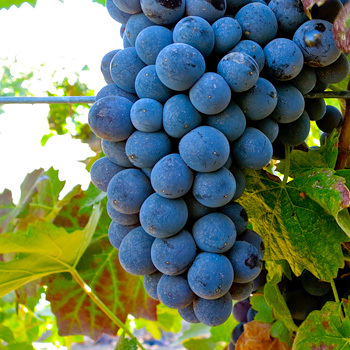 Some of the most famous wines to come from Italy are made from this grape. The grape produces wines that taste of cherries, violets, herbs, vanilla, and tea. It can take on a wood or spice taste due to aging in oak barrels. Lately in Italy, this grape has been blended with Cabernet Sauvignon or Syrah to create “Super Tuscan” wines. Also made in California. Better quality usually means a higher price. But when matched with almost anything with a tomato sauce these wines can be…, all I can is, Abondanza! All you need to know about wines made from this grape is they are made into fresh, young drinking wines (within one year) with up-front fruit flavor, and are low in alcohol and high in marketing appeal. Why? The most famous versions of these wines, Beaujolais Nouveau, come from the Beaujolais region of France. They are harvested, crushed, fermented, and bottled within a short period of time so that they can show up at your wine shop by the third Thursday in November every year. Have some at Thanksgiving and hold the rest until summer. Generally, these wines are very affordable. Grown mainly in Italy, this grape is associated with making big, bold, rich, red wines that smell of tar, roses, and exotic fruit. It tastes of dried fruit, cherries, and licorice. With age, the toughness softens and can become more approachable. Try a bottle with salami or Italian-influenced meat dishes. Among the most expensive wines to come from Italy, but the best versions are worth it. The other great red grape of the Piedmont region (Nebbiolo being the most famous) of northeast Italy is made into wines of varying styles. It can be made into a New World style, that is, it can be an early drinking wine, with cherry-fruit flavors. It can also be made into a brooding, developing, hearty style, which over time shows its true fruit flavors. Regardless of style, it almost always has good color, high acidity, and low tannin. A few countries like Australia, Argentina, and the U.S. have successfully made Barbera. But its true home is in Piedmont, in the villages of Asti and Alba. More affordable than some Italian red wines, Barbera is a perfect match for pasta with red sauce, veal, grilled pork chops, or swordfish. Another quality red wine from the Piedmont region in northeast Italy. Not the strongest bouquet, but the black cherry flavor makes up for it. It is a dry red wine that is made to be consumed young (within 2-4 years), not unlike Beaujolais in this regard. You should be able to find quality bottles of this wine between $12 and $15. Try it with beef, chicken, veal, or soft Italian cheeses like mozzarella. Spain’s most famous red grape is also found in Portugal, where its name is Tinta Roriz or Aragonez. In Spain the wine flourishes in the Duero river valley and neighboring Rioja. It can be made into a wine that is 100% Tempranillo or it can be blended with Cabernet Sauvignon. The color is a dark purple and the taste is reminiscent of strawberries and black cherries. The flavor matches the in-your-face bouquet. Among the most affordable of quality red wines, it can be matched with smoked ham, spicy sausage like linguiça or chorizo, as well as roast lamb. There are deals on this wine out there. If you find a good bottle you won’t be disappointed in the price or the quality. Argentina has become the biggest producer of wines made from Malbec. The French can use it as a blending grape in red wines made in Bordeaux. The only place in France you will find it as a stand-alone wine is in the Cahors region in the southwest. In Argentina, Malbec is the country’s proudest and most consumed red wine. Perfect with marinated steak on the grill or other grilled meats. Argentine versions are affordable and worth seeking out. The King of White wines. But in my opinion, not necessarily the best white wine in the world. A dry wine, it tastes of butter, butterscotch, and oak. Can age but generally not as long as red wines. Grown around the world, it is among the most expensive white wines. Consider matching it with saltwater fish, shellfish, pork, ham, pasta with butter, chicken, fowl, or even duck. A wonderful smelling and tasting wine that can be consumed young, and more affordable than Chardonnay. Not as dry as Chardonnay, this wine has a lower alcohol content and therefore is not as heavy. Among the New World wine-producing countries, New Zealand makes the best Sauvignon Blancs hands down. Matches well with poached, grilled, or sautéed freshwater fish, chicken, turkey, or roast pork loin. In my opinion, the best and most versatile white wine grape in the world. It is grown most famously in Germany where it is made from dry to super-sweet. The best part of Riesling other than its taste, is the fact that it is low in alcohol. Riesling is also grown successfully in California, Washington State, New York State, and Austria. Try Riesling with your favorite Chinese or Asian food and hold on! In France, this wine can be made into a wide range of styles from dry (Coteaux de l’Aubance) to medium dry (Vouvray) to downright sweet (Quarts de Chaume). It is also the most widely planted white wine grape in South Africa. South African versions are quite affordable. It tastes of melon, peach, citrus, and spice. It can be a stand-alone wine or matched with cold cuts, crab salad, grilled trout, or swordfish. Sweeter styles match well with fresh fruits like strawberries (and cream), fruit flan, and cheesecake. One of the great white wines of Italy. It is also grown in France, Oregon, and California. It has a golden-yellow color and an herbaceous, vegetative, exotic fruit-type bouquet. Pinot Grigio is a bargain compared to many French and American white wines. Serve chilled with chicken, turkey, seafood pasta, fish, or shellfish. Arguably the world’s most famous dessert wine, Sauternes, is made from this grape (and two others: Sauvignon Blanc and Muscadelle). In many New World countries, wines are often made from 100% Semillon. It can be made bone-dry to lusciously sweet. Australian versions are second only to the French versions, which are very expensive. If you are lucky enough to try sweeter versions, marry it with puddings or blue cheeses. Dry versions go well with fish or shellfish. Spicy is the most common word used to describe this wine. Its name comes from the German word for “spicy” (gewürz) and a town in Northern Italy named “Tramin.” It is made in France, Germany, Austria, California, Oregon, Chile, New Zealand, and Canada. It can be made from dry to sweet. Drier versions tend to be more affordable, especially New World versions. Sweeter versions are not as expensive as Sauternes. Matches well with duck, smoked fish, and almost all foods from India and South-East Asia. This grape has many names because it is grown in so many countries; from Portugal in the west to Greece in the east and from South Africa to Australia and the U.S. It is therefore not surprising that it is made in many different styles. The major styles are dry, sweet, and sparkling (Moscato d’Asti/Moscato Canelli of Italy). Chilled Moscato d’Asti is a great, affordable alternative to expensive Champagne. Australia is known for its sweeter styles. Sweet wines made from this grape go well over ice cream. Very reasonably priced. Very aromatic and reminiscent of fruit, honey, musk, or flowers, this wine often has higher alcohol content than other white wines like Sauvignon Blanc or Riesling. You can find this wine being made in France, Italy, the U.S., Australia, and South Africa. Well-made versions from France can be moderately expensive. New World versions may not be as complex but generally they are more affordable. This wine can be consumed as an apéritif or with Indian food, most chicken dishes, as well as shellfish. The other dry white wine grape of the Rhone Valley, it can be blended or made into a stand alone wine. It is made quite successfully in Australia as well. The bouquet smells of honeysuckle and the taste brings forth honey, pear, and spice. It is a heavier white wine with a touch of oiliness. French versions are usually blended and generally more expensive. The French also make it into a dessert wine. Australian versions are usually 100% Marsanne and more affordable. Goes well with pork roast, grilled shellfish, lobster in cream sauce, and roast duck. Pinot Blanc is grown and made into wine in France (Alsace and Burgundy), Germany, Italy, Austria, Canada, and the U.S. Not as aromatic as many other white wines, Pinot Blanc has a spicy, creamy, dried-nut flavor. A subtle, dry white wine, it is considered very much a “food” wine because of its higher alcohol content, although it can hold its own as an aperitif. It goes well with cold cuts or fresh-water fish. French versions are considered the best but the price is higher than you would expect. One of the two major dry white wine grapes of the Rhone Valley of Southern France is often blended with Marsanne (the other major white wine grape of this region). Some Roussanne-based wines are heavy on the oak (as in oak barrels for aging). Unoaked versions have more upfront flavors like dried pears and herbal tea. Prices begin at $15 and go up as high as $30 and even higher. Try it with poached salmon, flounder, or shrimp. The great white grape of Galicia in the northwest of Spain, it is also grown in northern Portugal. It is a lighter, dry white wine with an exotic, spicy, bouquet. Its taste is reminiscent of dried peaches or apricots. This wine is typically consumed young (not suitable for long-term aging) and is best matched with fresh water fish and shellfish. Very affordable, it can be hard to find because of its obscurity.